Stage 13 will put a smile back on the faces of the sprinters, who haven’t had many opportunities up to this point in the race. That fact underlines how demanding this year’s route is; everyone’s legs will be starting to feel it. Fortunately, this stage is relatively short. Following all of the mountains, there’s no doubt a few brave souls will try to escape. Even in a peloton where teams have just eight riders, they’ll be hard-pressed to go all the way. There’s a very good chance this stage will end in a bunch sprint. After surviving a trio of brutal Alpine stages when many of his sprint rivals abandoned, Peter Sagan got his reward with a third stage win in the 2018 Tour de France. Alexander Kristoff (UAE Team Emirates) was second to the Bora-Hansgrohe rider. Arnaud Démare (FDJ) was third in stage 13. His victory in Valence Friday marked Sagan’s third Tour appearance with three stage wins — he earned a hat-trick in 2012 and 2016. The overall standings did not change after the flat 169.5km race. Geraint Thomas kept a 1:39 lead over his Sky teammate Chris Froome. Tom Dumoulin (Sunweb) is another 11 seconds back in third. A four-man breakaway animated the day. Thomas De Gendt (Lotto-Soudal), Michael Schär (BMC), Dimitri Claeys (Cofidis), and Tom Scully (EF Education First-Drapac) were the day’s escapees. However, the peloton never gave them enough leash to race for the stage win. After his three companions dropped back to the peloton in the final 15 kilometers, Schär carried on alone. Eventually, he was reeled in with a little more than five kilometers remaining. Schär did receive one consolation prize, appearing on the podium as the stage’s most aggressive rider. He also noted that the windy weather made for a difficult day off the front. After Schär was brought to heel, Trek-Segafredo led the peloton into the final three kilometers. Then with one kilometer to go, FDJ moved to the front to position its sprinter Démare for the finale. But as soon as they moved up, Philippe Gilbert (Quick-Step Floors) launched a sneak attack. Although he got a brief lead on the peloton, Gilbert was caught as Démare wound up his sprint. Kristoff was right on the Frenchman’s wheel, perfectly positioned, but Sagan was just behind him. As Kristoff moved up Démare’s left side — early as the Norwegian prefers to do — Sagan kicked and came past on Kristoff’s left to win. 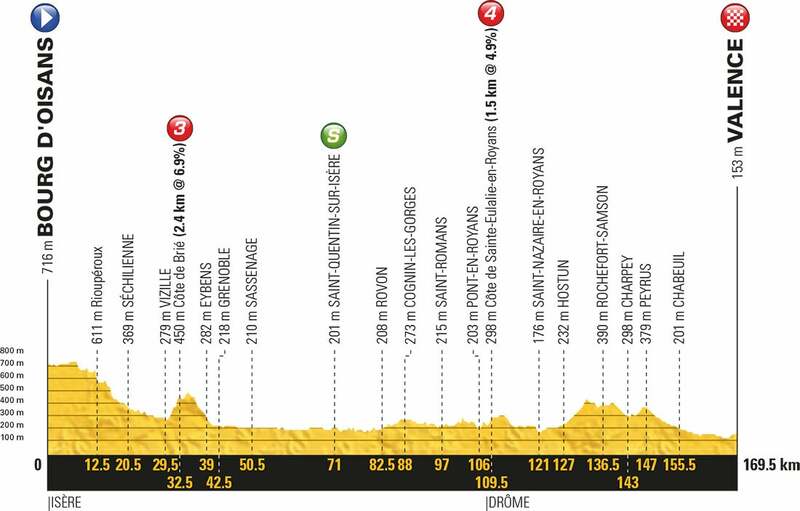 Saturday’s stage 14 might not be as favorable for the sprinters with a short climb to the finish after a 188km race from Saint-Paul-Trois-Châteaux to Mende. It could be an opportunity for Thomas to add a few seconds to his overall lead. “It’s a tough finish, I’ve done it a few times,” Thomas said. “I think potentially a breakaway day, so it’s gonna be a hard start.